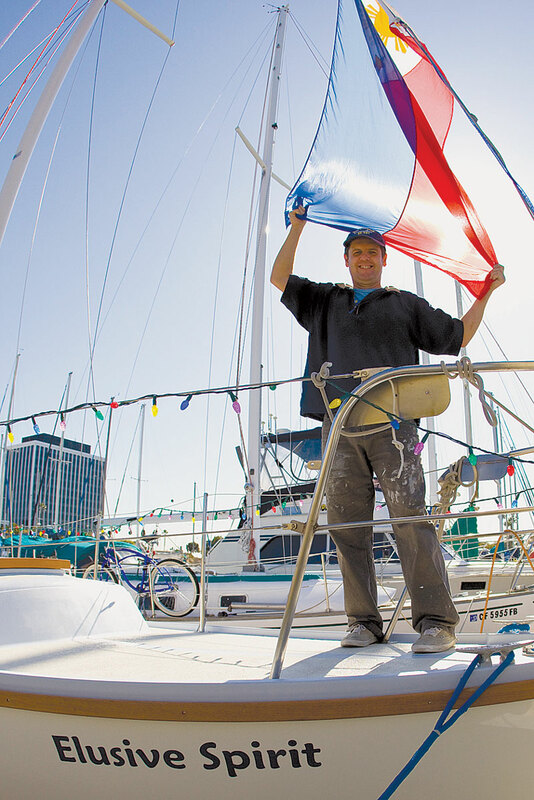 MARINA DEL REY — Jim Sullivan has spent the past few years living aboard his 1968 Cal 230 sailboat at Pier 44 in Marina del Rey. But after an 8,000-mile nonstop journey across the Pacific, he plans on changing addresses. After a send-off party March 4 at Del Rey Yacht Club, the 50-year-old Michigan native set sail from Redondo Beach’s King Harbor March 11 aboard his 30-foot engineless boat to the Cebu Islands in the Philippines with two goals in mind: to raise awareness to end dolphin captivity, and to get married. “Sharon’s my princess, and she’ll be waiting for me in the Philippines,” Sullivan said. The conservationist and hopeless romantic aims to sail Elusive Spirit along the north equatorial current, passing south of Hawaii, north of the Marshall Islands and south of Guam. The trail was a popular route for Spanish galleons of the 1700s, but Sullivan doesn’t believe many boaters have attempted to sail the route since then — much less in a 30-foot engineless boat. “This would be the longest passage I’ve ever made in my life,” Sullivan said. And he is by no means a novice sailor. In 2003, Sullivan sailed his first Cal 230 — dubbed Elusive — to Hawaii, Samoa, Vanuatu, Australia and the Solomon Islands. After leaving the islands, Elusive was hit by a typhoon. During the storm, a log punctured the boat’s hull, causing it to take on water and prompting Sullivan’s EPIRB to activate. A Japanese carrier passing by the area picked up Sullivan, who felt he had to leave the boat behind, as another storm was developing on the horizon. On his current XPAC 8000 Expedition, Sullivan has brought along National Geographic photographer Armando Valdez Kennedy to document the voyage, along with recording equipment to document the sounds above and below the water’s surface. “Instead of bringing these dolphins into our world, part of my sailing engineless is about entering their world to record their sounds and images, which I plan to share with my (XPAC 8000 Expedition) followers once I arrive in the Philippines,” Sullivan said. Whatever the marine animals they encounter on their trip may be, Sullivan is certain the findings will be interesting. “We’re going to be in an area that not many people get to document,” he said. “I think we’re going to be in a good position to get some good stuff. “This is a very personal journey for me,” Sullivan said. “More than just overcoming a physical challenge and attaining my personal goals, the expedition is meant to educate people about the unnecessary slaughtering and captivity of dolphins worldwide.” Sullivan will use the latest satellite communication to send messages ashore during his journey, which will be posted at thedeepradioshow.com. There, followers of the adventure can also direct words of support and encouragement to Sullivan throughout the three-month journey. Updates on the trip and real-time monitoring of Elusive Spirit’s location via Google Maps will be published on the site, as well. Upon arrival in the Philippines, Sullivan expects to restart his radio show — “and get married. That’s the reason for the trip,” he said, jokingly. Actor Ric O’Barry, who starred in the television series “Flipper” and was featured in the Oscar-winning documentary “The Cove,” rode out with Sullivan from Marina del Rey to Redondo Beach, to show his support of the project. O’Barry’s Dolphin Project and the Earth Island Institute are supporting organizations of the XPAC 8000 Expedition. In addition, Sullivan created a “Pennies for Life” program, to allow anyone interested in supporting his mission to pledge a penny for every mile he sails. Proceeds will benefit Earth Island Institute. For more information, visit thedeepradioshow.com.